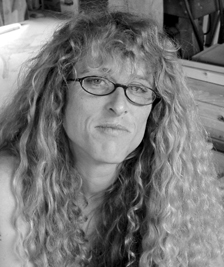 The following interview with artist Diana Chebuliez is a walk through "Unreal Estate," an exhibition of her mixed media sculpture and works on paper and canvas by Alison Hildreth on view at CMCA, June 9 - July 24, 2005. The artists share a fascination with intellectual and physical systems of structure, representation and interpretation. Literature, biology, the nature of man and memory, are entwined through imagery and materials that mix the personal with the iconic in representational and lyrical work. Diana Cherbuliez received a B.F.A. from the San Francisco Art Institute and M.F.A. from New York State College of Ceramics at Alfred University, Alfred, N.Y.
CM: Lets start with this piece called "The End." Materials are cigarettes, beehive frame, and glass. DC: Were standing in front of a section from a beehive. Its actually one of my fathers. Hes a psychiatrist and a beekeeper and I kind of see those activities of his and the way of thinking and the affinity for systems attributing to a certain way of my own thinking. I made a wreath by saving all of my cigarettes and making first a tail and then bending it around and building it into a hand that grips its own end of a tail, so in a sense its unending. And I equate cigarettes, (theyre all hand rolled), I equate them equally with death and indulgence as I do labor, so I guess the overlap here for me with the hive is the kind of frenetic, yet inherently fatal behavior of bees, combined with the indicator in a sense, framing the indicator of my own frenetic and (laughs) fatal behavior. So I guess thats where I go with it. I like the height we placed it at because it requires a kind of peeking in and a discovery which is similar to what I do with my dads hives when I open them up to look into them and theyre attractive and beautiful and frightening at the same time. 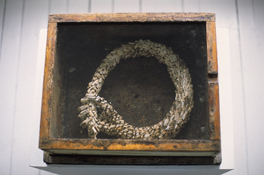 ©Diana Cherbuliez, "The End," 2005, cigarettes, beehive frame, glass, 8"x18"x20"
CM: What about the fact that the material has the potential for disintegration? DC: I like exploring that aspect of materials and sometimes I try to freeze them from disintegration. Some of these cigarette butts are two or three years old, yet they still remain. The essence of a hand rolled cigarette, one of the characteristics of it, is that the tobacco may shake out, but youll still have this paper roll, with the indication of the nicotine being sucked through it and its blatantly a handmade object, which is an important element to me, as it is with the hive. My father has to build them. from under the artist's bed, glass, brass, 7.5"x20"x9"
CM: While were talking about unusual materials with potential for disintegration, this is a piece that people are responding very strongly to, and it is beautiful. Its called "Waiting For You." Materials are one year of dust from under artists bed, glass, and brass. 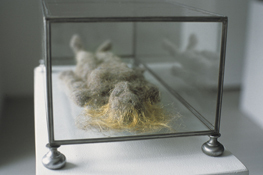 DC: Well, its the figure of a woman thats molded out of compressed dust bunnies from under my bed and shes prone. To me its obvious that I was alluding to the glass coffins of two fairy tales: Sleeping Beauty and Snow White (at one point the dwarves encase her in a glass coffin). Im interested in the kind of non-time, but yet the encompassing time period that waiting is and the consuming aspect of waiting. This was a year of dust that I collected when I was waiting for someone and I ceased waiting when I finished and patted it into a form. One thing that has been pointed out to me is one person who saw the work said they clicked right into the parallel with ashes to ashes and dust to dust. I love that looping aspect that art can allow you. CM: You obviously love story, myth, and mystery. Lets talk about where your art comes from. DC: Well, like I said about the cigarette piece, "The End," a lot of it does come from my upbringing. My grandfather was a horticulturist, my father a psychiatrist and beekeeper, and my mother is a landscape architect. So a lot of things were kind of made legitimate to me: analytic thinking, an understanding of structure, of thought, and construction in a sense, since that was one aspect of my mothe'rs work. Id say thats probably the most important influence on me making art, but I was also encouraged to make art, which I think was unusual for people of my generation. I was born in 1965. One example of that era is that my mother always wanted to be an architect, but was grossly dissuaded by Yale University who said that women being trained as architects end up getting married and leaving the profession "which is a waste of the schools and the parents resources," which is one of the funniest artifacts that we possess - her letter from Yale stating that. Ive always had a compulsion to make things. Part of that is defining my place in the family, with four sisters, and part of it is just a natural need to. CM: Have you always been so experimental with materials? DC: That is definitely one area of art that Im particularly fond of, people who experiment and explore the nature, the qualities, and the references that are inherent in different materials. I wrote in one of my statements that painting is about illusion and sculpture is about allusion, because I think we have this kind of funny dismissive relationship with objects around us. I hope that when people look at my work, they will be turned on to substances around them. What Ive done with stories in this case is melded some narrative elements but also tried to present an alternative path to some classic narratives. I guess theyre structures in a sense for my personal concerns, social concerns, artistic concerns, the priviledge of being an artist, the intensity of committing yourself to making something, the vulnerability you experience when you place your art out on the laundry line. CM: Heres a piece called "Prop." How did you decide to make a pair of shoes out of matches? DC: Prop is the sister to a video I have in the show called Wish. These are shoes that I studded with red match heads, completely covering them. In Prop they are burnt. They have a medieval foot brace that would hold each shoe onto your legs. This stems initially from the reading of a Salman Rushdie story called The Auction of the Ruby Slippers, a slightly futuristic story where theres a passionate race to buy these shoes because theyre the only thing that can get you home. Obviously, home is a conceptual place for most of us, as well as physical  a place of comfort, safety, and nostalgia. Ive posed these shoes in the air on multiple nylon threads holding them in kind of a kicking, ascending posture - almost frozen dancing. And the lines that theyre suspended from are a pretty important element for me, since Im making fun of the idea of invisible suspension that artists always claim  everyone can see the nylon thread. It also provides a really a beautiful shadow and to me, the lines have a gesture, a drawing quality, but they also remind me of a spider web which is an entanglement, which is a physical and emotional state. I guess in a way these are the kind of failed aid you use to return. Also another element is they are kind of copied from an illustration from a fairy tale in which Snow White is invited to the wedding and made to dance in red hot iron shoes until she drops dead. CM: Oh, lovely. I didnt remember that version. When did you start making art? DC: Ive always painted and drawn. In fact, I recently saw my kindergarten report card in which my teacher stated that I had "an unusual ability to draw, but showed a marked discomfort with paint." I started making things like all kids do, little fantasy settings, making dioramas, and I always was the queen of the class in making dioramas. There is a bratty, demonstrative aspect to my sculpture and to my making of it and again I think it does reflect on the need to have an identity within my family, and also in my elementary classes and in my junior high classes. I remember that the first sculptural object I ever made was a marble gravestone for my cat. Ive always had a kind of morbid side because I was lucky to be brought up on Charles Addams, Roald Dahl, and Edward Gorey. 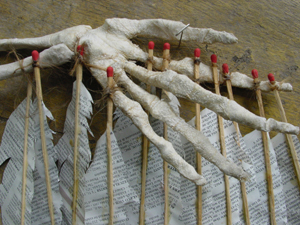 matches, The Gallery Guide, beeswax, hair, 32"x42"x32"
CM: Speaking of dioramas, heres an interesting piece. DC: This piece that were standing in front of is a small work table. Its called "Project" [noun] or "Project" [verb]. I love titles with multiple readings to them. This overlaps my current state with that of Daedeluss. In the past Ive done work where Im subtly claiming to be the first sculptor, God. In this, Ive aligned myself with the second sculptor, Daedalus. On this work table is a skeletal human arm made out of sausage casing and attached to it are a number of feathers. On the table are elements of the fabrication of this project. Seagull feathers are made from fireplace matches that are carved and split, and pages from the Gallery Guide that are beeswaxed together. Then on the table are elements of the fabrication of the objects. My ashtray is inset into the table and theres a carving of the island that I live on with the escape route mapped out. I see the gallery guide pages as a symbol of artistic aspirations. This is the listing of all the current gallery shows on a month to month basis. To see your name in it is a really exciting thing. Obviously, if you dont see it again its a bit of a letdown. Its a mark of achievement and therefore of desire. Of course you have the matches, beeswax and the paper that are absolutely overlapping with Daedaluss wings, being flammable and susceptible. CM: How does living on an island separated from the artworld displayed in these pages affect you? DC: Initially, the biggest drawback of living on an island was that I no longer had materials I could discover in dumpsters and streetside pick up. If you want something you have to order it and then plan and go get it. That was kind of a shock. Other aspects of being on Vinalhaven in terms of making art is that I have an incredible amount of time to make art. There are no distractions. Its a very beautiful place that has a strong seasonal rhythm. Its also a place that really respects labor and craft, a very traditional, close-knit community. Stories become very important in small communities and they hold onto their stories with a constant flow of gossip. CM: How long have you lived on Vinalhaven, Diana? DC: Thirteen years. I was away for two years at graduate school. CM: Lets talk about these pieces called "Edgewise." DC: This does relate directly to what I said about the importance of stories and histories and what they mean to a community. I took photographs of gravestones at the largest graveyard on Vinalhaven. Vinalhaven has a very notable granite carving history, so our gravestones are quite magnificent overall. I took digital pictures then scaled them to the size I wanted, then overlaid horizontal lines that were the thickness of a particular size mirror. I then measured off those drawings, cut the mirrors, stacked and laminated them. 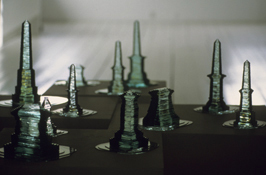 These small gravestones sit on topographical paths of layered glass. What my interest in the material was physically, was that the result of this cluster of gravestones is that from far away you see through them, and as you approach them and look down at them from an angle they have a dark core. From above you get glimpses of yourself. I was interested in the mirror as a straddling place for self identity and time. Every time we look in the mirror theres our childhood face, grandparents face, etc. It all flashes to us, it all overlays to our own image. I find graveyards to be also a place where you straddle your own identity and your own mortality. So that was the intellectual impetus. CM: And as objects, theyre beautiful things. spruce, apple wood, mirror, crayon, 17"x11.5"x12"
CM: Lets move on to Alice in Wonderland. This sculpture is called "Not Through." Materials are spruce, applewood, mirror and crayon. DC: What it is is a fourteen inch carved applewood figure of a post pubescent Alice. She stands in a two walled room that I framed up with the spruce and walled the two opposing sides with mirror. She also stands on mirror, so you have these three reflective surfaces. Her leaning on the mirror to her own reflection forms a zero, so the mirror behind her forms an endless march of these zeroes. "Not Through" relates to my thinking about my lack of flexibility with imagination. I think that happened with puberty because with puberty I got a certain self-conciousness. Shes applewood which is a material I have used before to allude to the fall from the Garden of Eden and the self knowledge which is a result of it. I love the fact that the apple is a symbol of the U.S. but its an import, an immigrant. ©Diana Cherbuliez, "Drink Me," 2005, mirror, mirrored lab bottle, 4"x18"x8"
CM: Good point. What about this piece "Drink Me?" DC: "Drink Me" is actually a very familiar sight at my shop, which is a spill. I took a piece of lab glass and mirrored it. Its a laboratory bottle that incidentally used to carry acid, which is a funny aside. On it is a label which is a print out from the original Alice In Wonderland where her hand is clutching the bottle. Its on top of a spill in a topographic layered form of mirror. The experience is of looking at it, and seeing your reflection distorted in the mirror on the bottle, and seeing your reflection peeking over it. The act of doing that explains the piece or allows you to go somewhere with the piece. CM: Well, Diana, thank you for taking this walk through "Unreal Estate" and sharing some insights into your work in the exhibition.